If you have never had baked apples in your life, you are gonna have to try. It is one of the most delicious winter desserts. The apples taste unbelievably amazing just by simply baking them. With just a few additional ingredients this dish turns into an irresistible treat. And the great news is it is very simple to make. You can experiment with your favorite ingredients for the filling. My mom used to make baked apples with a jam, cinnamon sugar, almond filling topped with whipped creme. This recipe is a modified version of my beloved childhood recipe, without the added sugar and using coconut creme instead of regular whipped creme. Feel free to use regular whipped creme if you tolerate dairy. If you cannot eat nuts, simply omit the almonds. Using coconut flakes is a great alternative if you want to add that extra crunch to it. When choosing the jam opt for a brand that doesn’t add too much sugar. If you have ever tried to make your own you quickly realize that you will have to add sugar or some sort of sweetener to make it taste good. Amounts of sugar vary between different brands. Try to opt for one with less added sugar. Definitely stay away from high fructose corn syrup. So make sure you read your labels before purchasing a fruit spread. Just like with all labels, the fewer ingredients the better. Adding jam to the baked apples makes them so irresistible.Especially in combination with the cinnamon and creme. You can try it with your favorite kind. I used raspberry or strawberry jam. But feel free to be creative. 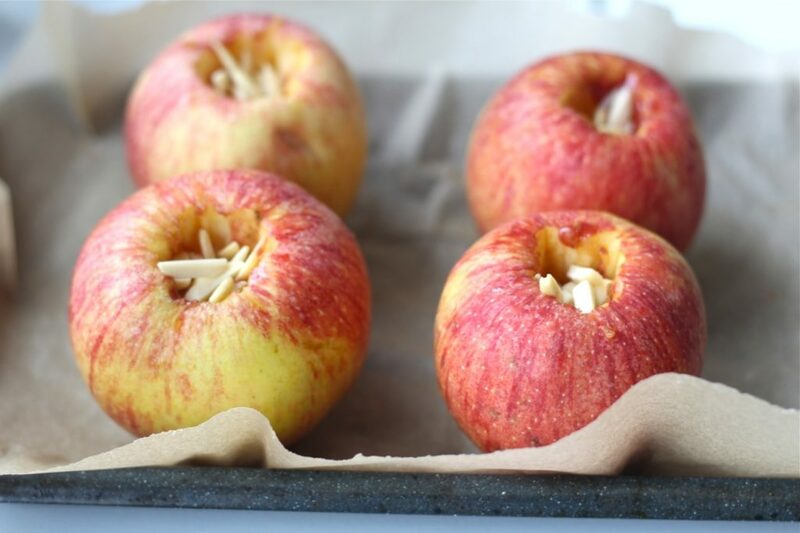 These baked apples are the perfect winter dessert for cold dark winter evenings. Next time you go to the farmers market get some local apples and a fruit spread and try this recipe. These delicious baked apples are the perfect winter dessert. They are easy to make and gluten free, dairy free and paleo friendly. Wash the apples. With a knife or apple corer cut a hole into the top of the apple. Carefully removed the core of the apple while keeping the bottom of the apple (1/2 inch) intact. Place the apples on a parchment paper lined baking sheet. Add 1 tsp jam in the opening of each apple. Add 1/4 tsp cinnamon to every apple and finally add 1 tsp slivered almonds to every apple. Bake for about 30- 45 minutes until the apples are soft to your liking. Baking time will vary depending on the size of your apples.